The new Album Man Made Machine from Motor is set to release on April 17th, 2012. Due out on CLR’s new sub-label, CLRX, the album features guest appearances from Gary Numan, Martin L. Gore and Douglas J. McCarthy. The Knife’s madcap electro frenzy, all harsh synths and rapid arpeggios – complete with singer Douglas McCarthy’s rather aggressive musings – is testament to the fact that, vocal re-focus or not, this fourth long form effort is by no means any less experimental, or more accessible. Watch the (unofficial) video of The Knife feat. STARK is the new project from David Gooday and Simon Granger. Techno, Funk, House, Disco and a little bit of everything else thrown in for good measure. All STARK Graphics by Simon Granger. Dave aka DTG was one of the founder members of Nitzer Ebb and he has moved through life listening to all forms of music. Normally reverting back to his roots in electronica. 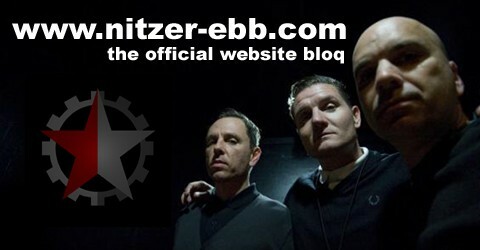 Simon was the man behind the Nitzer Ebb album graphics. He also provides inside information on the creation of Nitzer Ebb’s special brand of provocative art, propaganda and colour schemes. Enjoy StaRK Tunes on Soundcloud and with a little bit of visual stuff on Youtube as well!